Bring the romance of a beach side setting to your event with our beach themed starfish candles. Each 1 1/4" x 2" favor has an included tea light nestled in a poly resin white iridescent finish base encircled with shells and finished with a rhinestone adorned starfish. Each candle comes packaged in a black bottomed gift box with a clear top and finished with a white satin bow. Hi...can you please tell me if the candle are natural based? which I am looking for...thank you! Yes, it is. 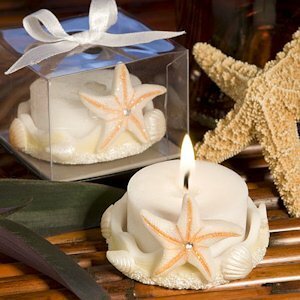 It is a Natural Base Starfish Candle Favor. You can also order a sample at a special price of $0.89 so you can see how it looks like. Can I put a special ribbon?